Portobellos are a great vessel for carrying this savory stuffing of crab and fresh herbs. 1. Preheat oven to 400º F. Trim the mushroom stems from the caps and discard the stems. Under cold running water rinse the tops to remove the grit. Carefully with a spoon, scrape out the dark gills from the underscape of the caps. Transfer to a paper towel to pat dry, then lay the mushroom caps on parchment paper over a baking sheet. 2. Combine the crabmeat, shallots, fresh parsley, salt substitute, pepper, and egg together in a small mixing bowl. Add 1/4 cup of almond meal and mix well. 3. Fill each mushroom cap with the crab mixture. 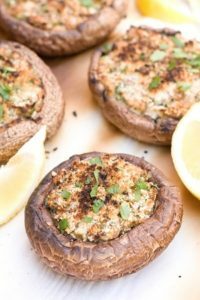 Top each mushroom cap with 1 teaspoon of almond meal, a pinch of salt substitute, and pepper and a drizzle with coconut oil. 4. Transfer the tray to the oven and bake for 20 minutes. The top will become slightly crispy. 5. Serve immediately with additional parsley and lemon wedges for garnish. Don’t forget to squeeze a bit of lemon juice on the crabmeat as you eat. * Crab contains healthy amino acids and vitamin B-12, both for which can help brain function.